Exploring age-old questions about the healing power of love, the interconnectedness of all life, and the presence of God, authors Allen and Linda Anderson offer extraordinary true stories about animals that answer and affirm beliefs. Each story illuminates a dark corner of doubt or opens your heart to new revelations of the divine. Health and fitness expert Richard Simmons tells the story, "Spotted Angels," about the Dalmatians who enriched his mother's last days. A retired teacher remembers the hamster who brought inner city school children on a journey from hate to love. A mother reveals how a special ferret helped her autistic son to become the hero of his Little League baseball team. Empathic cows in a field surround a grieving woman and shed tears with her. A man in a coma gets a visit from his best canine friend and the dog?s kisses bring him back to consciousness. A moose delivers the message to a minister that animals go to heaven. A dog's persistent attendance at church services enlivens an entire congregation. This book celebrates the spiritual bond between people and animals. Dogs, cats, horses, ferrets, rats, birds, snakes, llamas - reveal love and compassion, teach hope and forgiveness, or serve as mirrors to the soul. If you have ever felt alone or abandoned, this book will bring comfort, renewal, and spiritual insights. 50 black-and-white photographs of adorable animals accompany these heartwarming stories. "Traditionally angels wear white robes and have wings. In Allen and Linda Anderson's new book, angels wear fur coats and have woofs. You are a pet lover, you understand the special bond between humans and animals. And there's powerful evidence of animals at our side, every day, helping us on the bumpy road of life, according to Allen and Linda Anderson, authors and co-founders of the Angel Animals Network, a group whose goal is to help people realize that animals are our spiritual partners." 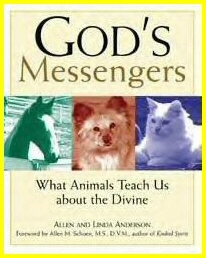 "Your beloved pet may actually be a messenger from God, says a noted author. . . Linda Anderson and her husband Allen, the book's coauthor, believe that God sends messages of love, acceptance, and even proof of life after death though animals." "Fitness guru Richard Simmons showered his beloved mom with jewels and took her on exotic trips all over the world, but the most precious gifts he ever gave her was a pair of Dalmatians....I don't think I ever saw my mom happier, he says in the book God's Messengers: What Animals Teach Us about the Divine by Allen and Linda Anderson (New World Library)." "The Andersons' most recent book, God's Messengers: What Animals Teach Us about the Divine, illustrates how traditional cultures have viewed animals as messengers and mediators of the divine, which is a lesson we need to relearn. The book is a bold reminder that consciousness takes many forms and is not restricted to humans." "Animal lovers tell stories of rescue. . .God's Messengers: What Animals Teach Us about the Divine makes you wonder -- who's rescuing whom?" "It’s no longer the case that many people dismiss a pet as merely a possession they own. No, a growing number of people understand that their dogs and cats and reptiles and birds, and other companions are beings with souls who are in their lives for a reason." "If you never considered animals to be messengers from God, this collection of real stories about how animals connect us with the Divine will have you wondering, if not convince you that God does exist and can be seen through the animals that share our world."